The Pritikin Diet: Discredited By Medicine But Now Endorsed By Your Federal Government! How is that a discredited diet developed by a man with no scientific or nutritional background and with no legitimate scientific studies supporting it has been endorsed by CMS to be taught intensively to patients after their coronary bypass surgery or heart attack? Nathan Pritikin is an “inventor” who became convinced that heart disease could be treated by following an ultra-low fat diet. After establishing his “Longevity Center” in Santa Monica for well-healed clients, (Average price per week for one is about $4,500) he wrote a book entitled “the Pritikin Program for Diet and Exercise” in 1979. The book sold more than 10 million copies in paperback and hardcover, and was on the New York Times Bestseller Top Ten list for more than 54 weeks. He died at the age of 69 after slashing his wrists with a razor blade. The Pritikin brand, however, lives on and continues to promote a diet that contradicts scientific findings in the last two decades that clearly indicate an ultra-low fat diet is not sustainable or effective in reducing heart disease. There are two aspects of the Pritikin brand that make it stand out from the rest of the fad diets that clutter the book store shelves and the internet blogs: a thin veneer of scientific legitimacy and funding by the federal government. Although partially true, this is a totally misleading statement. The reference from the “prestigious” New England Journal of Medicine is a letter to the editor (thus not peer-reviewed research) written by R. James Barnard, Ph.D in 1990. Barnard has a Ph. D in exercise physiology and has worked as a consultant for the Pritikin center since 1978. He has written a book (Understanding Common Diseases and the Value of the Pritikin Eating and Exercise Program) which was published by the Pritikin organization in 2013. Good science involves generating a hypothesis and then performing experiments to prove or disprove the hypothesis. In Barnard’s case he clearly had decided beforehand that the diet worked and he spent the rest of his career trying to gather data from the humans in the Pritikin center (60 studies) and from rodents that he fed high sugar and fat diets (40 studies) to support this claim. Barnard does have a publication in Circulation (as opposed to a letter) but it is also an example of bad science and would not be published in a reputable journal in this day and age. His Circulation publication in 2002 looks at what happens in 11 men who are given an ultra low fat diet and forced to exercise aerobically for 45-60 minutes daily. They were forbidden to consume alcohol, cigarettes or caffeine. There was no control group for comparison and we have no idea what the lifestyle of the men was before entering the study. And, of course, the investigators were not blinded and were extremely biased. What a surprise! The men lost weight, had a lower blood pressure and a lower cholesterol level after 3 weeks of being tortured on the Pritikin diet and exercise plan. It’s a wonder they didn’t slit their wrists while trapped in the Pritikin center undergoing this program. Barnard’s other publications, which serve as the sole “evidence base” for the Pritikin program are similar to the Circulation publication: they involve short, unblinded, uncontrolled studies of what happens to various metabolic parameters when individuals are subject to the Pritikin torture program. The Pritikin diet is similar to other now discredited diets promulgated by Dean Ornish and Caldwell Esselstyn which are ultra low fat and almost vegetarian. Such ultra low fat diets are not recommended by any major scientific organization and are not supported by the scientific literature. This diet eliminates most of what makes for a tasty meal. The most recent scientific evidence on diet strongly contradicts a substantial number of these recommendations: for example, dietary cholesterol is not of concern: fish and vegetable oil, particularly olive oil, consumption is encouraged, dairy fat reduces atherosclerosis and obesity. As part of the Affordable Care Act, Congress established and funded something called “intensive cardiac rehabilitation” or ICR. The portion of the act that establishes ICR was crafted because of the influence of the legendary ultra low-fat/vegetarian evangelist Dean Ornish upon Senator Tom Harkin of Iowa. reduced the need for percutaneous coronary interventions; and a statistically significant reduction in 5 or more of the following measures from their level before receipt of cardiac rehabilitation services to their level after receipt of such services: low density lipoprotein;triglycerides;body mass index;systolic blood pressurediastolic blood pressure and the need for cholesterol, blood pressure, and diabetes medications. These criteria are clearly crafted to correspond to the weak data that Barnard had published during his time working for and promoting the Pritikin Longevity Center. The study by Barnard and colleagues (1983) showed that participation in the Pritikin Program was associated with a reduction in the need for bypass surgery. Although the sample size was small, the study provided long term follow-up. At five years, there were four deaths (6%). There was no direct comparison group but the authors reported that, at the time (1976-1977), mortality associated with coronary artery disease was “as high as 50% by the third year.” At five years 12 patients (19%) had bypass surgery. Since all patients were recommended to have bypass surgery prior to enrollment, there was a reduction in bypass surgery over the follow-up period. The 1983 “study” by Barnard is really not even worthy of publication. He was collecting information on 60 participants in the Pritikin program who had been told by their physicians that they needed coronary bypass surgery. We have no idea what would have happened to these highly motivated, cherry-picked individuals if they had not entered the Pritikin program. Comparison to historical controls to support the efficacy of an intervention is unacceptable in today’s scientific literature. I am a huge supporter of working with patients who have coronary artery disease or are at risk of heart attack to reduce their risk by lifestyle change and appropriate medications. I applaud science-based government initiatives to study this and implement proven techniques. Unfortunately, the way that ICR was foisted on Americans shows how easily good ideas can be hijacked by a few fervent hucksters who have the ears of prominent politicians who lack the background to properly understand science-based medicine. Which Popular Diets Are Supported By Science? Which of the currently popular and highly marketed diets are best for weight loss and cardiovascular health? Can science answer this question? 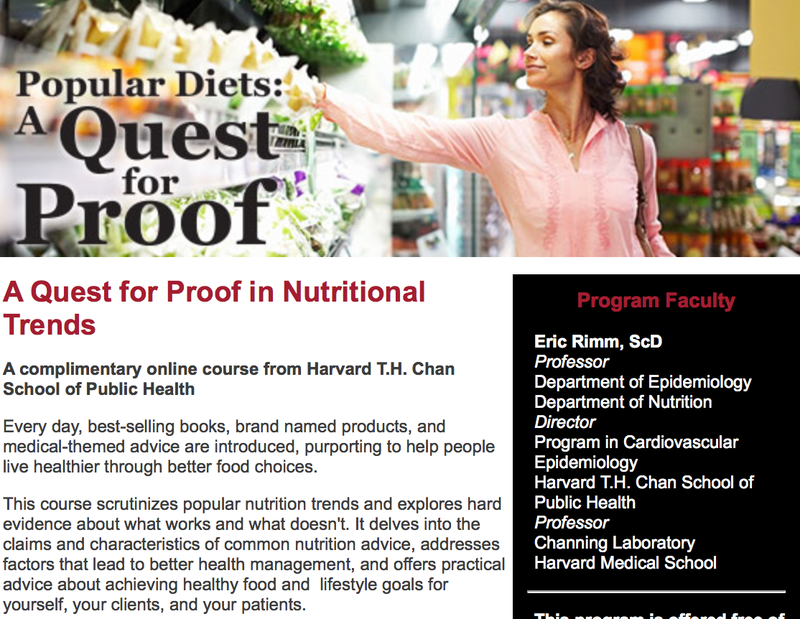 I just took a 90 minute online “course” taught by Eric Rimm of the Harvard School of Public Health; I think he does a good job of summarizing the scientific evidence on this topic and presenting it in a way that the average layperson can understand. 1. When evaluating the efficacy of a diet to control weight, the best evidence comes from observational studies that involve tens of thousands patients over decades and/or (preferably) randomized control trials that last at least two years. 2. The Paleo, Wheat-belly, gluten-free, Atkins, South Beach, and Zone diets do not have good evidence supporting sustained weight loss or health benefits. In general, people who follow these diets will be consuming lots of fresh vegetables, nuts and “healthy” fats and avoiding processed food, which is good, and this likely explains any benefits achieved. 3. Of all the diets, the low-fat diet (Ornish/Pritikin/China Study are the extreme examples of this) is the only one which has strong evidence showing an absence of benefit. Yes, the diet that was recommended to Americans for 30 years does not help with weight loss in the long run for the vast majority of individuals. Dr. Rimm spends a good amount of time on this, highlighting findings from a study of 50 thousand women (the Women’s Health Initiative), which lasted for 9 years. In the first year, women on the low-fat diet (counseled to consume <20% of calories in the form of fat), lost more weight than those on the usual diet, however, in subsequent years they gained back the weight and did not differ from the higher fat consuming group. There was also no difference in the rates of dying or contracting any disease between the two groups. The problem with the low fat diet was adherence. Although a very small percentage of individuals can remain on a vegan or really low-fat diet and successfully lose weight and be healthy, the majority of us can’t. Over time, the low fat group gradually added fats because they taste better and they are more satiating. 4. The DASH diet has evidence showing improvement in blood pressure, and cholesterol. The heart of the DASH diet is an eating plan rich in fruits and vegetables, low-fat and nonfat dairy, along with nuts, beans, and seeds. Unfortunately, it was developed in an era when all fats were considered bad and proof of cardiovascular benefit is lacking. 5. Mediterranean diet. Gets a strong pass from Rimm with multiple studies showing benefits in both weight reduction and reduction of cardiovascular mortality. The Med diet also demonstrates good long term adherence because of its diversity and inclusion of fat (for taste and satiety). Improved adherence has been shown to be the major determinant of diet success. When you add regular counseling and support to any diet it works better and can be sustained. 1. Lots of fresh fruits and vegetables. These contain fiber, phytochemicals, minerals. 2. Two servings of fish per week. 3. Plenty of nuts (and drupes! ), legumes, and seeds. 4. Grains are allowed, preferably all whole grains. 5. Moderate alcohol consumption (1 drink/day for women, 2 drinks/day for men). 8. Eggs and dairy are allowed. Dr. Rimm is still clinging to the idea that all saturated fats should be limited and prefer ably replaced by PUFAs or MUFAs. He presented this graphic (courtesy of Dr. Willet at Harvard), which illustrates the most prevalent concepts about saturated fat replacement. Risk of heart disease is on the y axis. According to this graph, If you replace saturated fat with trans fat or sugar/refined starch, risk goes up. If you replaced saturated fat with unsaturated vegetable fats or whole grains, risks go down. Most nutritional experts now can agree on the importance of the key components of the Med diet and the lack of efficacy of low fat diets. The disagreement comes in whether moving that arrow down from saturated fat to unsaturated fat is truly beneficial for weight management or cardiovascular health. There are multiple types of saturated fats and multiple types of unsaturated fats and the scientific evidence is not currently robust enough to make the claim that replacing any saturated fat with any unsaturated fat is a healthy change. There is no evidence that low-fat or no fat dairy is healthier than full fat dairy (see here and here). Eating no, or low, fat yogurt with the natural fat replaced by sugar and other additives likely moves the arrow up, raising your risk. This kind of processed food gets a pass from mainstream nutritionists for some reason. Saturated fat from pasture-raised pigs and cows consumed in moderation is not unhealthy or weight gain promoting. In the end, Dr. Rimm and I agree on about 95% of the science and recommendations in his course. Take a look and you can tell your friends that you just passed a Harvard course with flying colors!